Dozens of Popular Supplements May Not Be Doing Anything for You—and they could even be destroying your health. Read this breakthrough report right now to discover why food is the best medicine to help prevent, relieve, and heal everything from heart disease and cancer to diabetes, arthritis, Alzheimer’s disease, and more! Right now 70 percent of women over 50 are taking calcium supplements to strengthen their bones. But here’s the shocking truth—calcium supplements are now linked to an in-creased risk for heart attacks. And calcium isn’t the only supplement that’s come into question. Are you taking an omega-3 or fish oil supplement? If so, you’re in good company. Millions of people take them for heart and brain health benefits. But the latest research shows you may not get these amazing health benefits. For example, daily doses of up to 4,800 milligrams of EPA and/or DHA (types of omega-3 fatty acids) per day showed no heart health benefits. Even a full gram of omega-3 fatty acid supplementation did nothing to reduce the number of cardiovascular events in high-risk patients. What’s worse? Scientists now say that omega-3supplements may increase men’s risk for prostate cancer by 71%! A five-year study of nearly 2,300 women showed that those who regularly used a mix of carotenoids (vitamin A, beta-carotene, and lutein) had a higher risk of dying from breast cancer or other cause. Although this doesn’t prove the antioxidants caused the problem, high use of carotenoid supplements have also been linked to lung cancer in smokers. And I’ve barely scratched the surface. Supplemental vitamin E may not provide the same benefit as eating foods rich in vitamin E, and it too, may increase the risk of prostate cancer. CLA (conjugated linoleic acid)—the popular weight loss supplement that’s also said to prevent diabetes and cancer—may actually increase harmful cholesterol levels. Even daily multivitamins may be a waste of your hard-earned money. So how can you fill your body with disease-fighting, health-boosting nutrients? EAT! It turns out, in most cases, the extraordinary healing power you need is in FOOD—not pills. The proof? Let’s go back to calcium for a minute. You do need more calcium as you age. But, the problem is your body can’t process the large amounts found in supplements. The best way to get it is in doses less than 500 mg—like the calcium you’ll get by enjoying three fat-free or low-fat servings of milk, cheese, or yogurt throughout the day. If you don’t do dairy – go for non-dairy sources made from soy or almonds, or fill up on kale and broccoli. Supplements can make you sick! In Environmental Nutrition you'll discover how popular supplements like omega-3s, vitamin E, calcium and more can harm your health! Learn more, risk-free! Same goes for those omega-3s. You’re better off getting omega-3s from foods instead of supplements. Research shows that you can reduce your risk of dying from heart disease by 36% when you get those omega-3s by eating fish regularly! Tuna. Chicken. And cottage cheese. Why? They’re high in lean protein. And that’s important because as we age we start to lose muscle mass, which can lead to sarcopenia. Sarcopenia is a condition that can cause a decline in muscle function, eventually robbing you of your independence in later years. Some experts believe adults age 60 and older should get about 25-30 grams of protein per meal to maintain and build muscle. This not only provides enough protein, but also ensures you’ll get enough leucine—an essential amino acid that’s critical for building muscle. And if your mom told you fish is good brain food—she was right! Research links the benefits of omega-3s to the treatment of depression and Alzheimer’s disease. Why do foods outrank supplements when it comes to your health? First up, supplements were never meant to be food substitutes the way some marketers sell them today. Supplements were intended to be exactly what their name says: a “supplement,” or addition, to your already healthy diet. When scientists first isolated vitamins and nutrients in foods that were essential to normal health and vitality, as well as disease prevention, they thought the magic was in the nutrient alone—allowing sales of specific supplements to skyrocket. But we now know nutrients don’t work alone. They work with your body, and the whole food to bring you life-saving health benefits. Take broccoli. It’s loaded with a phytochemical called isothiocyanates. (Don’t worry about trying to pronounce it—just know that it’s linked to a lower incidence of tumors). But you’d never get the same benefit by taking a supplement, because without the enzyme found in whole broccoli sprouts your body absorbs about 8 times less of the tumor-fighting nutrient. Food that helps prevent memory loss! Eating blueberries, strawberries, and other berries may prevent age-related changes in the brain like memory loss and loss of mo-tor control. Scientists discovered that the high levels of antioxidants in berries not only protect cells from harmful free radicals, they even change the way brain neurons communicate, and prevent neuron-damaging inflammation! Look at vitamin E. Eat foods rich in this vitamin, and you’ll help fight age-related diseases like cancer, Alzheimer’s disease, and heart disease. But as a supplement it won’t deliver. That’s because supplemental, synthetic forms of vitamin E only contain one chemical compound—fat soluble, alpha tocopherol. However, the natural forms of vitamin E found in foods, contain four types of tocopherol and four tocotrienol compounds. And the latest research also suggests that many nutrients, plant chemicals and even dietary fiber join forces and work together to bring you more health benefits than they do alone. Lab studies show that tomatoes help block cancer development. But combine tomatoes and broccoli together and you reduce cancer risk even more! Here’s a great reason to eat more beans. Healthy bacteria in your gut use dietary fiber and resistant starch (a type of fiber in dried beans) to produce a fatty acid that seems to protect colon cells from cancer. Some foods are so powerful, research shows they can actually deactivate carcinogens or cause abnormal cells to self-destruct. They’re called phytochemicals and they’re found in garlic, broccoli, and other cruciferous veggies. So how do you know which foods to eat to fight cancer, ease arthritis pain, reduce your risk of heart disease, lower your blood pressure or cholesterol, or prevent diabetes? Simple. Start a subscription to Environmental Nutrition today. For nearly 40 years, health-conscious readers, nutritionists, and registered dietitians have relied on the unbiased, accurate, expert information in Environmental Nutrition. There’s no medical-ese, every issue is easy to read and understand. You know it’s accurate because it’s based on the latest research and scientific facts. Raw veggies and fruits may cut the risk of heart disease—even if you have genetic risks! Although there are likely many com¬pounds at work, it seems that quercetin —a flavonoid in apples, onions, grapes, and cherries—has antioxidant and anti-inflammatory properties. Plus, many fruits contain potassium known for its blood pressure-lowering effects. And, vitamin C, an antioxidant found in many fruits, may shield the body from the damaging effects of oxidative stress by relaxing arteries and preventing arterial plaque from breaking off and causing a heart attack. The easiest way to avoid diabetes—drink water! Just two glasses a day reduced chances of developing high blood sugar by 28%. What to eat to help beat osteoporosis, breast cancer, pump up your heart health, and get relief from menopause! Tea the USDA says is the most powerful for lowering blood pressure. The food that provides the same arthritis pain-reducing effects as ibuprofen. You’ll get real life answers for all your food and nutrition questions, like is it really safe to microwave foods? Which pre-packaged foods and frozen meals won’t knock you off your health goals? How safe are caffeinated drinks and can new relaxation drinks and foods safely calm you down? The best bagels for your buck—and why popular Pepperidge Farm versions didn’t make the cut. The healthiest brands of frozen fish to get hooked on—including 6 brands of breaded or battered versions! Best bottled teas—only one Lipton and one Snapple version get our thumbs up. The healthiest mixes for everything from pancakes and waffles to muffins, cornbread, and cakes. Plus, you’ll see if dried fruits are as healthy as fresh? If you really absorb more nutrients from foods if you juice them? Which energy bars are nothing more than candy bars in disguise, and more. Blueberries may help fight breast cancer! Cancer researchers found that tumors derived from aggressive cancer cells in mice were reduced 75% in those fed a diet containing a blueberry powder with the equivalent of two cups of blueberries per day. Further studies are needed to determine a human dosage and if blueberries can be a strategy in fighting breast cancer. You won’t find this kind of useful, nutrition information in other publications. That’s because Environmental Nutrition editor and registered dietitian Sharon Palmer, together with the nutritional advisory board, have made it their mission to expose the truth behind conflicting health claims. They’ll help you see through hyped-up marketing claims and questionable research studies to bring you the best ways to prevent disease, lose weight, and live a healthy, vibrant life. You’ll see why you should steer clear of gluten-free diets unless you really have a confirmed diagnosis of celiac disease, wheat allergy, or gluten sensitivity. Although lots of people will try to convince you carbs are bad for your health, did you know filling up on whole grains can slash risk of heart disease by up to 30%? Foods that Work Like Sunscreens! The color pigments and nutrients that guard plants from the sun’s harmful rays also fortify us with sun protection. Lycopene, a carotenoid found in tomatoes, watermelon, and red bell peppers, helps reduce your skin’s sensitivity to UV light —decreasing the chance of sunburn. Fill up on tea, onions, apples, or soy foods and you’ll take in polyphenols. These plant com¬pounds protect your skin from the effects of UV radiation by suppressing or reversing the skin cancer process. For the best in sun protection, wear sunscreen and eat plenty of foods rich in lycopene and polyphenols! Which foods contain plant chemicals that actually deactivate carcinogens or cause abnormal cells to self-destruct. The foods that turn your body into a “probiotic factory” to help fight disease. A surprising benefit of prunes—they can help fight osteoporosis. Type of chewing gum that can trigger painful bouts of IBS. Veggie that takes a big bite out of cancer risk! Just chopping or chewing it releases special compounds that help clear carcinogens out of your body. The food that tricks your stomach into feeling full—and the drink that may stop fat cells from developing. Great for weight loss! People from Asia typically don’t get wrinkles until they are in their 50s? The secret may be soy. It turns out that genistein—an isoflavone and antioxidant found primar¬ily in soybeans, helps guard the skin against sun damage. Scientists think the high amount of soy in their diet helps to fight wrinkles. Garnish that may stop breast cancer cells from growing! It’s parsley! That dinner plate garnish we often push to the side, is probably the thing we should eat first. Just two tablespoons of parsley, which is high in vitamins A and C, packs 144% of the daily value of vitamin K (great for bone and heart health)! Plus, it contains a flavonoid that’s been shown in research to stop breast cancer cells from multiplying and growing. You gain a lot—when you lose just a little? It turns out, you don’t have to fit into your skinny jeans or look great in a bikini to reap big benefits from weight loss. Losing just 10% of body weight slashed the risk of getting type 2 diabetes up to 58%! And the health benefits of losing lasted up to 10 years even if you gain the weight back! Trans fats (like those found in baked goods and some margarines) can shrink your brain? Seniors with high levels of trans fats in their blood scored poorly on tests and scans showed their brains were actually smaller—a trait linked to Alzheimer’s disease. 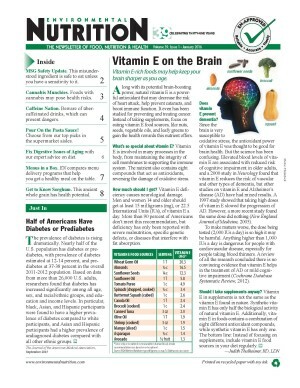 However, seniors with higher levels of vitamins B, C, D, and E, and those with higher omega-3 fatty acids scored well on the same tests and had larger brains. Beer may be better for you than wine? Beer has more antioxidants than some types of wine, and could reduce your risk of heart disease by up to 40%, help you live longer, lower your risk of type 2 diabetes, and dementia. Excess body fat is especially dangerous after menopause? Excess fat actually sends out chemical signals that increase your risk for certain types of cancer—including breast cancer. Probiotics won’t work unless you have enough live bacteria in your system? Foods that Sweep Stroke-Causing Sodium Out of Your Body! 98% of Americans are taking in double the amount of sodium they should. Cutting back on sodium could save countless lives and billions in health care costs. But using less salt is just part of the equation. New research shows that potassium—a mineral found in fruits, veggies, beans, and dairy products can sweep sodium right out of your system. Plus, potassium is also known to relax blood vessel walls, which helps lower blood pressure. If that isn’t enough, studies show higher potassium intake can help reduce your risk for cardiovascular disease and lower your risk for stroke! For foods high in potassium, enjoy: lima beans, plain yogurt, bananas, sweet potatoes, grapefruit, mushrooms, or prunes. By eating foods like fiber (a prebiotic), you help guarantee that disease-fighting probiotics can survive the acidity of your stomach and make it to your large intestine where they do their work. You’ll find out why foods high in vi¬tamin C are so important for helping to increase bone mass… how peanut butter can help fight diabetes… how “comfort foods” may increase risk for depression…and why you should “stalk up” on celery to help prevent and treat Parkinson’s and Alzheimer’s diseases. It’s impossible for me to tell you all the excellent health information you’ll find in every issue. That’s why the best thing you can do for your health right now, is to start a risk-free subscription to Environmental Nutrition. Your satisfaction is guaranteed, 100%. If at any time during your subscription, Environmental Nutrition fails to live up to your standards and give you the health and nutrition information you need to maximize your wellness, let us know. And we’ll immediately refund your full subscription price. No questions asked. Another reason to try Environmental Nutrition today? Research shows fit, middle-age adults have medical costs that are as much as 38% less than their unhealthy counterparts. Don’t miss out. Start your subscription Environmental Nutrition today.